According to most online fence installation cost estimators, it costs around $2,000 to install a fence. Most homeowners usually opt for a six-foot privacy fence. Irrespective of the type of fence that you choose, fence installation should not cost you more than $2,500. The maximum cost for a 6-foot privacy fence is $13 per linear foot while the minimum cost is $3 per linear foot. Why is Fence Installation Necessary? A fence facilitates privacy and security. It also enhances the visual appeal of your property. With a functional and elegant fence, a property will have a higher resale value. How Long Should Fence Installation Take? It depends on the size of the job. Most fence contractors usually take one to three days. Fence installation should not take more than a week. That is a sign of an over-extended contractor. How Long Will a Fence Last? The longevity of a fence depends on the material used. The most common wood fences are pine, cedar, and spruce. Cedar can last for up to 30 years while pine lasts for between 5-12 years. Spruce will not exceed 7 years. Metal fences last the longest. There are three types of metal fences: aluminum, wrought iron, and chain link. Wrought iron and aluminum fences are strong and elegant. However, they cost more. The cheapest metal fence is chain-link. It is also long-lasting. Longevity also depends on maintenance. A well-maintained fence will last long. Proper maintenance will also prevent over ninety percent of costly repairs. A homeowner has to decide between a wood or metal fence. 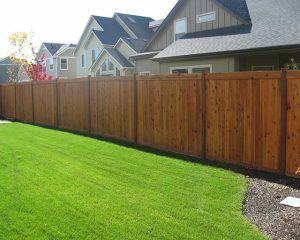 A wood fence is easy to install and is long lasting. Those looking for top-notch elegance need painted or stained wood fences. However, these require regular maintenance. The most low maintenance fences are sturdy composites, PVC, and vinyl. The disadvantage of aluminum is its lightweight nature. According to the American Fence Association (AFA), chain-link fences are secure and economical. All components of a chain-link fence are made of galvanized steel. Thus, they are rust free and require no maintenance. The AFA also recommends other types of fences such as cedar fence, which has a capability of lasting for more than two decades.